we are pleased to welcome you to our new Foreign Rights web site at Bacopa Verlag - specified on traditional chinese medizin and western herbs - and we are glad to give you a survey of some of our titles now. Here you will find information on some titles published by Bacopa Verlag. If you are interested in any of our titles, please contact us or one of our agents. This book describes the herbs available to us in the West as they are known in China. Each of the estimated 150 herbs, e.g. rosemary, basil, ladys mantle, fumitory, gentian, shepherds purse, lovage, etc., are designated by their German, Latin and English names as well as the thermal properties, taste and organs involved. Furthermore, indications and application fields are listed. A comprehensive index, a list of TCM physicians in Austria and international herbal supply sources complete the book. Using traditional books on herbs and recipes of Chinese Medicine as its basis, this book presents more than 220 individual medicinal herbs and approximately 110 recipes with an average of five modifications based on the criteria of TCM pharmacology. The chapter structure is based on the TCM approach and helps the TCM therapist - trained in TCM diagnostics to use Western medicinal herbs in accordance with TCM diagnosis and treatment strategy. In my opinion, the use of Western medicinal herbs based on TCM criteria such as temperature action, taste, transformation phases and organ involvement as well as descriptions of specific effects permits systematic application, since all existing information is based on comprehensible patterns. Praxisbuch - Nahrungsmittel und Chinesische Medizin (Practical Guide Foodstuffs and Chinese Medicine). Descriptions of effects and indications of conventional Western foodstuffs. Dietetics as an acute and therapeutic measurement and as a supplement to other treatment methods is of increasing significance in naturopathic practice. Foodstuffs as an integral part of healthcare have a tradition of over 4000 years in the Far East. While in the past millennia many different sometimes partly contradictory approaches and interpretations have been used in practice, todays age of worldwide globalization means that different cultures and philosophies are impacted and interconnected at an even faster pace. This process is also occurring in the field of dietetics. We have engaged in this complex matter through in-depth study of German and English literature in the fields of dietetics and TCM over many years. Furthermore, we have studied natural scientific sources and have also gained practical experience in the preparation of individual foodstuffs. In particular, this basic list includes foodstuffs commonly used in the West as well as some foodstuffs with specific therapeutic significance. The qualitative effects of foodstuffs such as they are described in traditional Chinese medical theory, have been supplemented by various findings in modern Western nutritional science that are primarily derived from nutritional substances as well as physiological and biochemical processes. Western terms describing diseases or symptoms had to be translated into disorders in Chinese diagnostics. There are different Chinese diagnoses available for one Western disease, depending on the etiology of a disease. For example, head ache may be caused by Qi stagnation, Qi deficiency, phlegm or other disorders. Depending on the etiology the Western symptom is only listed in the foodstuffs corresponding effects category. This means that the Western diseases listed in the different effects categories only show how one particular foodstuff is influencing the course of the disease. Besides the effects categories, the corresponding cycle, thermal effect and tastes are listed for each foodstuff. The corresponding cycle explains the cycle or pathway the foodstuff uses to develop its effect. The thermal effect differentiates between cold, cool, neutral, warm, and hot, while the bandwidth within one single temperature level can often be broad. Several tastes are usually listed, the first one mentioned being the most important one. After five years and 58 full-day task group meetings including quite a lot of individual work, the task group SBO-TCM Diätetik reached a milestone and completed monographs for 215 foodstuffs. To assemble descriptions of foodstuffs we focused on the technical literature available in German and English, which also includes the main Chinese literary sources. Furthermore, we discussed several current Western naturopathic and natural scientific publications in terms of the information they provided for classification of foodstuffs in accordance with the TCM. This book is a fully revised and enhanced edition of the original ABC der Kräuterheilkunde (ABC of Herbal Medicine). Classification in chapters such as herbs for the immune system, for the respiratory system, digestion, etc., have not been modified. Special chapters which deal with the correct use of medicinal plants for children and stimulant herbs for men have been added. By assigning specifically limited indications, descriptions of medicinal plants in each chapter make it possible to indentify a suitable plant for each related symptom. Since the author intended to cover the latest phytomedical research findings, this book is also a suitable reference work for all medical professions. This book of herbal medicine primarily addresses all those interested in self-medication who are searching for information on the correct application. This book explains in detail how medicinal plants can help people, how one can gain an intuitive understanding of herbs and the particular substances they contain, how to collect herbs themselves and how to treat plants that have been collected and make medicine from them. Many medicinal plants discussed in this book have fallen into oblivion. In times when many diseases are appearing for the first time or manifest altered symptoms, it becomes important to seek out new medicine. Medicinal plants that are well-known but have been forgotten can offer a plethora of possible treatments. Miriam Wiegele, author of several books, possesses in-depth knowledge of many alternative cures. Herbal medicine is her specialist field, and this book claims to be an insistent plea to rediscover the healing powers of plants in an appropriate way. Wer liebt nicht Blumen und Kräuter? (Who does not love flowers and herbs?) However, who still knows the stories behind these plants and how they got their names? This book contains a collection of myths and tall tales, of fairy tales and sagas about all those plants which enchant us whether it be in the house, yard or meadow. This book is not meant to be a childrens book, but a guide for adults to approach plants with heart and therefore become better acquainted with them. They can then pass on this knowledge to their children by telling them stories and stimulate their own imagination in the process. Therapeutisches Qi Gong (Therapeutic Qigong). The art of work with Qi. Therapeutic Qigong is an important part of Chinese medicine serving as an additional treatment for diseases and regeneration. By describing basic findings, this book offers an overview of the TCM organ Qi syndromes in connection with therapeutic Qigong in theory and practice. It hopes to offer well-established explanations and therefore help to provide a better understanding of Qigong as a possible means for prevention, regeneration and therapeutic companionship. A myriad of books have been written about Tai Chi. Why do we want to add another one to this colorful array? Most Tai Chi books are dedicated to a special form, the particular style of a Tai Chi family. In this book, Wu Runjin and Zhu Lichan seek to give an overview of the history of Tai Chi and its various styles. They describe the common features of the various styles of Tai Chi Chuan and outline the particularities of the various styles as well as the specific characteristics of different weapons which have been integrated in Tai Chi. Their main concern, however, is to anchor Tai Chi in the ancient tradition of Chinese medicine and to describe the effects of Tai Chi on health using a model of Chinese medicine. Their book targets beginners as well as advanced readers who want to gain an overview on the overall field of Tai Chi and are interested in the extent to which the significance of Tai Chi for health can be included in the model of Traditional Chinese Medicine. They dictated the book to me and I tried to present the background information on Traditional Chinese Medicine which they provided me with. This background information is important for understanding their explanations of Tai Chi in a clear and succinct way. In order to facilitate a better understanding of the text, I placed some of the explanations of basic medical terms in the appendix. Daniel Grolle is the initiator of the "Tai Chi Netzwerkes e.V. ", the Association of Tai Chi practitioners in Germany. Daniel Grolle has been learning from Tai Chi masters since 1980. He has also studied medicine, psychology, dance, theatre.he is a teacher who has made Tai Chi become better known in Europe. Today he teaches and trains teachers in Tai Chi in Germany and across Europe. With this book, Daniel Grolle has succeeded in structuring the deep and hidden knowledge of Tai Chi in a clear manner and presenting it to those interested in it in a didactic way, something which has never been done before. The basic elements of every movement are analysed and illustrated with photos of movements, true to scale body and foot diagrams and photos of correct exercises from behind right to the position of the teacher. Furthermore, the principles of Tai Chi are interwoven with original and simple exercises into the motion sequence with the result that the Tai Chi form and its content can be practised together. The book is aesthetically appealing and is of a high quality in terms of its contents. The book is accompanied by a DVD as a bonus. Here the exerciser can see the form's choreography analysed as in the book, but the movements are more apparent. The DVD has a German, English and Spanish audio track. This is the second edition of the book and is already considered a classic in Tai Chi circles. 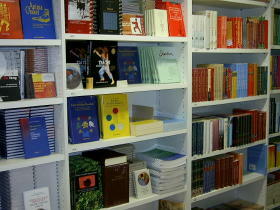 All of the material published by Bacopa Handels- und Kulturges.mbH. and its divisions (hereunder named as editor) is protected under copyright law. Written permission from the publisher is required if you wish to reproduce anything from our material, may it be in print or any other kind of media. All requests must be sent in writing on paper. The sender must be verifiable for us. Permissions are also valid only in writing and signed by the editor. All other means of communications may initiate a contact but may as well be disregarded. cite the exact material you wish to reprint. Also include any other information that may help us evaluate your request. For photocopy requests, please indicate the book's page numbers you wish to copy and how many copies you wish to make. Incomplete requests may not be processed and will neither be kept in evidence nor be returned. Processing requests takes approximately 1 month. - We will reply to you in writing as soon as we can, though response time may vary depending on the amount of requests we have to process. Therefore, submit your request for permission as early in your editorial process as possible. If you haven't heard from us in one month, please follow-up on your requests. Depending on the project we may grant subsidiary rights for advance serialization and pre-publication uses. Permission Fees may vary: Each request received by the department is evaluated on an individual basis. No fees will be discussed prior to our own evaluation of the project. Subsidiary rights is the licensing or selling of a book (in a related format) to another party who intends to sell it to their customers. As the popularity of our subjects increase worldwide, Bacopa receives many requests to publish in non-German languages. Therefore we look forward to establishing long-term relationships with more international publishers. Translation Policy: We prefer direct contract with the translator. Upon approval of a contract, our partner would then translate, edit, prepare, publish, and distribute its edition. A typical contract grants rights of varying exclusivity in a non-German language and sets a royalty that our partner pays upon its edition's sales. Please send us your current book catalog with your company information. - Permission may be given for territories (re-publishing a Bacopa product unchanged in a territory outside Austria, Germany or Switzerland. - Permission may be given to translate a Bacopa product into any foreign language and sell it outside Austria, Germany or Switzerland. * Paperback: republishing a book to sell in a paperback edition. * Hardcover: republishing a book to sell in a hardcover edition. * Large Print: republishing a book to sell in a large print edition for the visually disabled. * Abridgements/Condensations: a shortened version of the book sold through the mail to an existing list of members. * Book Club: the entire book which a mail-order company sells it to its members at a discounted price. * Direct Mail Licensing: a one-time deal when a direct mail company solicits potential customers. * First Serial: Excerpts from a book that appear in before the book's actual publication. * Second Serial: Excerpts from a book that appear after the book's publication. a. Audio: Recording the book on audiocassette/CD in either abridged or unabridged form. b. Electronic: Reproducing the book with a software or on-line service in CD-ROM, floppy disks, laser, DVD, or other digital media. c. Merchandising/Commercial rights: Converting the book's characters or content into non-book products (calendar, greeting cards, puzzle, playing cards, posters, etc.). d. Performance rights: Adapting the book into motion picture, television, documentary, theatrical, radio, or other form of entertainment. Please fill out the relevant information, so we can respond to your inquiry more effectively.